If you are using our Blogger Template and it has Instagram widget (Instafeed Version) Installed then you are at the right place. Today's tutorial is about How to Fix Instagram widget issue on Soratemplates templates, basically sometimes things doesn't work perfectly as you thought and in a result it all looks bad. So what if your template has Instagram widget installed but its not working, Don't worry we have a solution and will will teach you how to install that widget properly. 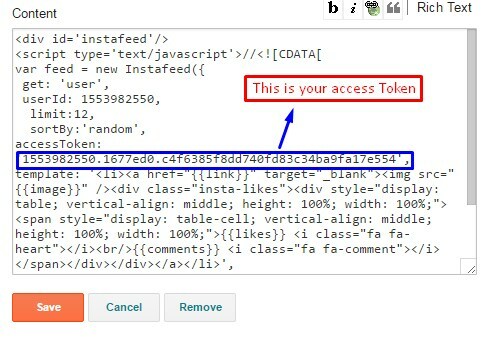 The main reason behind the problem is access token sometimes user don't generate their own and in case of overload on the servers our code stops working. So, Lets move further and see How to Fix Instagram widget issue on Soratemplates templates. You can check a live preview of that working script by clicking the button below. Access your blog Layout > click Edit link on Instagram Widget. Paste this Below code into it. This – 3541708255.1677ed0.5e79fa74dcac4a52bea0ebba51eacb88 is a access token ID. Now you need to create you new one and replace with this. 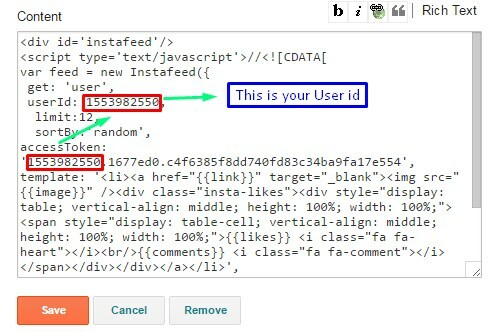 Login Via your instagram Account and Generate access token in a single click. 2. Once you get access token just replace with this access token with in a your code. After Generating the access token Copy the first part of that token and paste it to the User Id option of that widget. 2. Once you you are done save the widget by clicking save button. Congrats !! You have made it. now you have learned that How to Fix Instagram widget issue on Soratemplates templates. Visit your blog and check the widget live in action, hope you liked this tutorial, if you enjoyed then please share it with your friends, we are working hard to develop more such awesome widgets please stay tuned with Us. Selamat Tinggal !! (Goodbye in Malay). This is only for those templates which is made by us, if you are using our template please share your blog url. Yes, I also faced the problem that this widget doesn't work. What can be an issue? Same problem... I followed this tutorial, but no picture is showing.... I used to use the widget on many other template and it would always appear. Download the updated version of the template. Followed the directions exactly. It's not working. Hello. Thank you for this wonderful template. I added the code as you suggested above, then I changed the token and user ID, exactly as you described, but it does not work for me. Your widget code works perfectly with the six circular image links. The moment I change the token and ID to my own it ceases to appear. Could you tell me what I am doing wrong please? I solved the problem. I didn't realise that Instagram had to be used on a mobile phone and the images linked from the blog are actual posts which I needed to make myself! All sorted. Maybe this will help other people who have never used Instagram before. Hello, about 2 weeks the widget worked fine, but now it does not work (the code did not change and did not touch anything). Is there any way to fix this? You may have to generate new token.